The colon is intimately related to every cell and tissue in the body and if not taken care of a range of health concerns can develop, ranging from skin problems to serious diseases such as cancer. The blood is filtered through the colon walls and the colon is responsible for eliminating food and other waste products from the body. A lack of physical exercise combined with the over-consumption of packaged, processed foods are the main causes of poor colon health. Diets high in saturated or trans-fats, refined grains, animal products, sugar, preservatives and alcohol produce toxic waste, acid and mucus in the bloodstream and tissues of the body. Over time these toxins become impacted on the inside lining of the bowel wall, preventing the absorption of nutrients and becoming a breeding ground for parasites, bacteria and fungi which take up residence there. 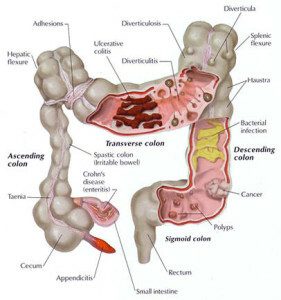 An unhealthy person can be carrying around a few kilos of impacted toxic waste material in their colon. A dirty bowel results in the rest of the body receiving a dirty blood supply as the blood is filtered through the colon. No organ or cell in the body can function optimally without a fresh supply of clean, oxygenated blood. If the colon is harbouring toxins and waste, disease and dysfunction are the ultimate outcomes. Eat Fruit and Veges daily: Fruit and veges are a great source of natural soluble fibre which helps keep waste moving through the colon. Increase Fluids: Drink 2-3 litres of fluids every day to hydrate the body and colon. This can include pure water, live veggie juices (especially green juices), herbal teas or vegetable broths. Don’t overeat: Overeating puts more strain on our digestive systems and slows down digestion and elimination. Focus on an alkalising diet, avoiding processed or refined foods, deep fried foods, alcohol, caffeine and carbonated drinks. Avoid Constipating Foods: Limit your intake of meat, wheat, sugar and dairy products Increase your soluble fibre.Try to eat an apple every day. Take 1 to 4 teaspoons of psyllium husks or chia seeds 2 to 3 times a day with extra water. Incorporate whole oats or rice bran into your diet which are good forms of soluble fibre. Enhance Mucoid Plaque Removal: Mucoid plaque is the name given to the accumulated wastes lining the colon. To begin the breakdown of this material take psyllium mixed with hydrated bentonite. It’s important that you take your psyllium and bentonite shake 1-2 hours either side of food to prevent hindering nutrient absorption and so that the psyllium and bentonite will stick to the wastes removing them from the colon, not the food! Optimise Your Digestion: Take 2 teaspoons of apple cider vinegar or squeeze half a fresh lemon into water or organic apple juice and drink 20 minutes before meals to stimulate digestive enzymes which break down your food. Consciously relax: Your colon has a strong muscular wall will can tense up and become restricted when we get stressed or anxious, resulting in constipation, diarrhoea, IBS and other digestive problems. Incorporate some form of relaxation techniques such as yoga, meditation, or tai chi into your day. Take Probiotics: Consuming live beneficial bacteria reduces gut toxicity, inflammation and other bowel disturbances. Probiotics also support our immune systems, aid food digestion and reduce food intolerances. Exercise daily: Exercise stimulates peristalsis (the movement of waste along the colon) and is very beneficial for sluggish bowels-it also helps reduce stress and promotes blood and lymphatic circulation.